· Flame arrestor made from corrosion resistant steel. 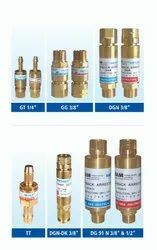 · Non-return Safety Valve - Inhibits reverse gas flow. · Flame arrestor made from sintered stainless steel arrests flashbacks reliably. · Fire protection element - It has a built in auto cut-out which automatically shuts off the gas supply. Looking for Flashback Arrestor ?